"Takeout-worthy stir-fry is only minutes from the table with Asian-inspired vegetables and Veggie Chick'n Tenders." Thaw vegetables; drain well. Set aside. Prepare noodles according to package directions. Set aside and keep hot. 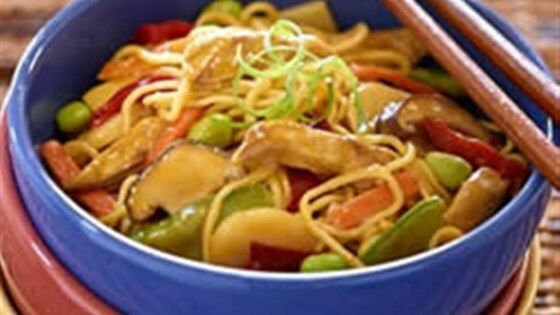 Prepare sauce: In a small bowl, mix together broth and soy sauce. Whisk in cornstarch. Stir in sesame oil. Set aside. In a large non-stick skillet over medium-high heat, heat oil. Add veggie chick'n tenders, ginger and garlic; stir-fry for 1 minute. Add vegetables; stir-fry for 2 minutes. Stir in sauce; reduce heat and simmer for about 2 minutes, until thickened. Pour vegetable mixture over noodles. Top with green onion. Grab your chopsticks and dig in! Fried rice goes full-on noodle! I love a great recipe with noodles and vegetables. This is a really easy and tasty dish!